At 700 to 800 metres above sea level, the area around and on Huangshan Mountain, is the perfect place and main area of production for the superfine Huangshan Maofeng tea leaves. Huangshan Maofeng is produced in several different places on the mountain, including Peach Blossom Peak, Purple Cloud Peak, Cloud Valley Monastery, Pine Valley Temple and Hanging Bridge Temple. In fact, Huangshan Maofeng is produced throughout the whole Huizhou District. This region boasts a temperate climate and receives plenty of rainfall. The annual average temperature is between 15 to 16°C, and the average amount of precipitation is between 1,800 to 2,000 millimetres. The soil is deeply layered and made up of the yellow earth typically found in mountainous regions. This type of soil is loose in texture and has good water permeability. It contains an abundance of organic matter and phosphorus potassium, and it has an acidity level of between ph 4.5 and 5.5 which makes it suitable for the growth of tea trees. Huangshan Maofeng was created by the Xie Yuantai Teahouse in the Guangxu Period of the Qing Dynasty (1644-1911). After 1875, in order to meet the market demands, each year, during the Qingming period (a time which falls around the 5th of April and is one of the 24 solar terms according to the Chinese lunisolar calendar), pickers would climb high mountains in Tangkou, Chongchuan and some other places in the Huangshan region in order to collect fat leaves and bud points, which were then fried and baked. They named the kind of tea made from this practice Huangshan Maofeng. Huangshan Maofeng must be picked carefully. The picking standard for top grade Maofeng is to pick one bud and one leaf just before it’s about to unfold Top grade Maofeng is picked during the Qingming period. Grades 1 to 3 are processed during the Grain Rain period (one of the 24 solar terms according to the Chinese lunisolar calendar, roughly falling around the 20th of April). After the fresh leaves are picked, they will be sorted to ensure that all of the leaves are of a high quality and that all of the buds are of a similar size. Then the fresh leaves will be separated by their differing degrees of tenderness and spread to dry out. In order to guarantee the quality and to keep the freshness of the tea, it is recommended that the tea leaves are picked in the morning and processed in the afternoon, or picked in the afternoon and processed at night. The manufacture of Huangshan Maofeng is divided into three procedures – heating, rubbing and twisting, and curing. 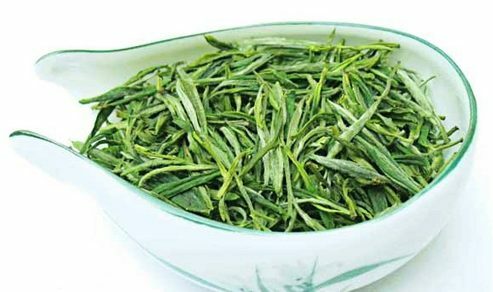 The shape of top grade Huangshan Maofeng is like a sparrow’s tongue and has thick leaves with white fluff on them. It is yellowish green, nearing ivory white, in colour and golden pieces grow below the tea leaves. It smells fragrant and tastes mellow and luscious. 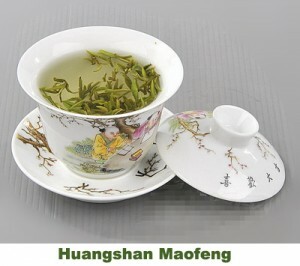 When brewing Huangshan Maofeng, you will notice that the tea water is limpid in colour. Thanks to the distinctive characteristics of the “golden pieces” and the “ivory” coloured leaves found in Huangshan Maofeng, the taste of top grade Huangshan Maofeng is sharply distinguishable from the taste of other varieties of Maofeng.